Here is another request for outreach on another project on behalf of the Arts and Culture program of the Toronto 2015 Pan/Parapan American Games in case you know anyone or any organizations that might be able to help. Feel free to pass along. On July 10th, 2012 TO2015, the Organizing Committee for the Toronto 2015 Pan and Parapan American Games, will recognize the three year countdown to the 2015 Games in Toronto. Promoting this milestone, TO2015 is planning an event titled “Play Me I’m Yours”. This event will consist of 41 piano’s which will be designed by artists from each of the 41 Pan American countries. Following this event the pianos will be distributed to locations around downtown Toronto where they will remain on display for public interaction until the end of July. We have a number of artists confirmed but there are still some countries that we are looking for local representation on. 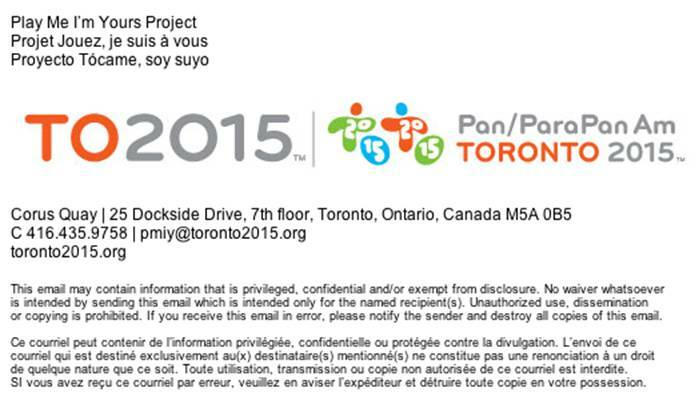 Please email pmiy@toronto2015.org for more information or with suggestions. ← Ipsita Nova blast – Nova wins a fabulous award!